Who ever said the end of the world had to be depressing? Sunset Overdrive offers a mix of Tony Hawk-esque mobility with over-the-top weaponry in a cheerfully-post-apocalyptic world. The story begins in Sunset City as an energy drink company launches their latest product, Overcharge, at a city-wide party. The drink immediately begins transforming its drinkers into grotesque, bright orange beasts that begin rampaging around town. 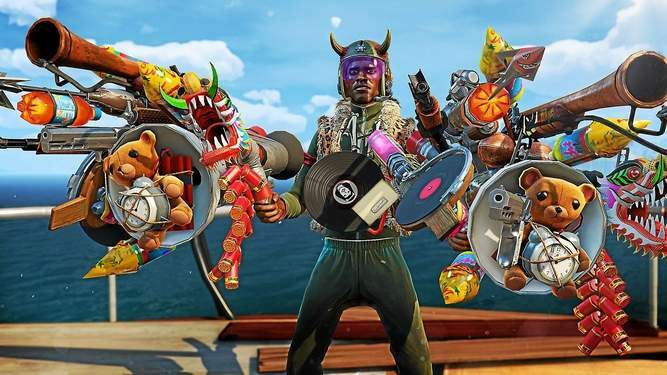 Your totally customizable main character’s response is to arm him or herself with goofy makeshift weaponry, like a vinyl record launcher or an exploding teddy bear gun, and start looking for other survivors. You can freely explore Sunset City through a hyperactive, cartoonish version of freerunning: you’ll bounce off cars, run along walls, and grind power lines in style as you move from one mission to the next. This form of uber-parkour makes simply getting around the city a blast, and shooting enemies while grinding on rails feels satisfying, thanks to an assisted aiming system. Doing stylish moves while fighting is a must, as enemies tend to chew right through your health bar when you’re not grinding or bouncing. But moreover, doing those moves will build up a Style meter, that activates power-ups and makes you an even more effective mutant killer. The game’s aesthetic feels like a rebellion against the overwhelmingly dark and grim shooters that have become the industry norm these days. Bright colors and ridiculous costumes are typical in Sunset City, and the characters never take themselves too seriously, in some cases going as far as to acknowledge that they’re characters in a game. Objectives are pointed out as if they were drawn on the screen, and some sound effects appear in a comic-booky way that will be familiar to fans of Scott Pilgrim. The explosions literally have the word “BOOM” written on them. The focus on this bright, fun atmosphere is like a breath of fresh air, particularly in contrast to Insomniac’s last game, Fuse, which took a very serious turn in tone during the course of development. This is especially apparent in the character editor. The number of possibilities is staggering, and you can buy more clothing options as you go along. Want to have a mohawk and wear denim? Or wear combat boots with a frilly skirt? The amount of customization rivals games like Saints Row 4 in breadth and absurdity. The absurdity of your weaponry matches the insanity of the world. While the characters may be bright and silly, don’t mistake this for a kid-friendly experience. Salty language is dropped commonly in most cutscenes, and monsters explode in a shower of bright orange blood when they die. These features can be toned down with a feature that removes gore and bleeps out curse words, but the tone overall is still darkly comic. For example, one character has to eat their arms and legs to survive the apocalypse, but still has an overwhelmingly upbeat attitude about it. The soundtrack deserves special mention. The music is a fitting punk rock medley that would fit perfectly in a skateboard game, but more impressive is that it amps up as you do better. Completing certain tasks or passing specific thresholds on the Style meter will layer new tracks into the mix. Some of the most memorable experiences came as I was tackling a boss fight and lyrics kicked in at the perfect moment as the action got particularly crazy. But that level of crazy has nothing on the multiplayer mode, Chaos Squad. You can team up with up to seven other players for a bit of friendly competition. You’ll work together to complete specific tasks, such as defeating a supercharged mutant, while also competing to see who can do the most damage. Eight players all working together using their best weapons can become almost too much to process, as bright explosions and acid showers fill the screen. Still, the resulting cacophony of Chaos Squad is an enjoyable extension of the single-player game that definitely lives up to the name. Sunset Overdrive’s one weak spot comes when it’s time to create new powerups, and you’re forced to defend your home base from waves of monsters in a tower defense game. You can build interesting traps and turrets to hold back the horde, but they always seem to overwhelm your fortifications regardless. Losing isn’t much of a problem, as the game is generous with its checkpoints, and the penalty for dying is almost non-existent. But grinding in circles trying to defend a fixed point feels antithetical to the fluidity of the rest of the game. 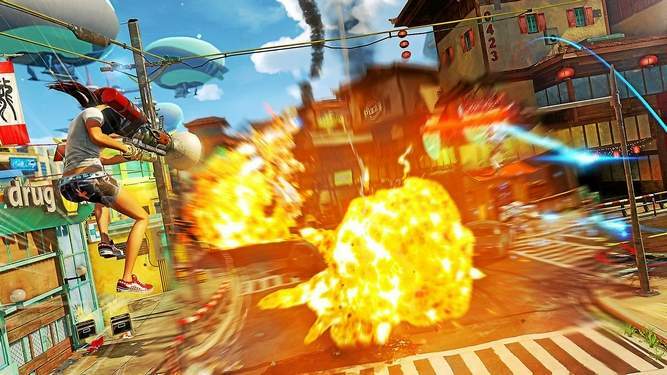 Overall, Sunset Overdrive is a video game at its gamiest. The action is fun and frantic, the art is colorful, the level of customization is extensive, and the writing is genuinely funny. People picking up an Xbox One for the holidays will definitely want to check this one out. Sunset Overdrive is available now for $59.99. Microsoft provided a copy of the game for the purposes of this review.